On the surface Big Moor is basically a slab of gritty sandstone sloping gently towards the east. One or two minor water courses cut through White Edge to drain the plateau westwards but nearly all the surface water seeps through marshy ground and coarse grassland towards the east and finishes up in the Barbrook. This stream dissects the Moor and runs south, through Baslow to join the river Derwent next to the caravan site within Chatsworth Park. One of the attached pages shows all the 26 crossing points of this stream from its source on Totley Moss. This may seem irrelevant but in many ways the crossing of the Bar Brook and crossing Big Moor were the defining features which lead to the establishment of settlements around the Moor. You will see from the History section that man was quite active on Big Moor in the Bronze Age. However after that period the population declined and became virtually non existent around Roman times. As a result there are no known Roman roads or buildings around Big Moor. Climate change must have been the dominant influence for this population movement. The valleys became safer places to live and the higher fertility around the Derwent valley lead to a string of villages being built from Baslow up to Hathersage. 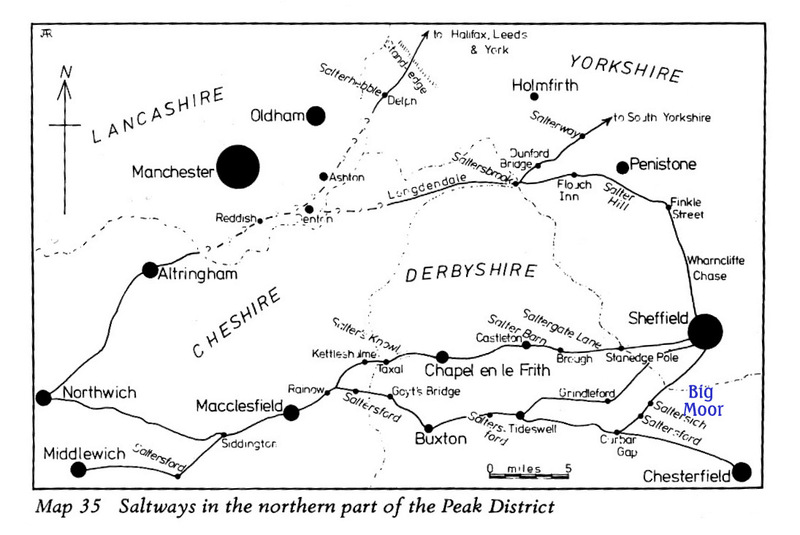 It is no coincidence that all these villages were good crossing points of the Derwent. The question to be asked here is why people needed to cross the Derwent? Obviously the locals needed to make good use of both sides of the river but the main driving force was trade. After the Romans, the roads of Britain fell into decay but following the Norman invasion and the founding of the monasteries, travel increased and before long markets were established in places such as Bakewell, Tideswell and Chesterfield. The distance to travel to such markets would define where they would succeed as realistically no one would go further than 7 miles from home and populations would soon become well established within this range. The inhospitable Peak moorland proved a distinct barrier to trade and initially tracks went either to the north or south of Big Moor. The northern track lead from Hathersage up to Lady’s Cross and over to Owler Bar and the southern track lead up through Curbar Gap, across the moor near Swine Sty, down to the Two Slabs bridge and then on to Whibbersley Cross before descending into Chesterfield. Crossing points were originally just fords across the water and heavy rains could mean several days delay before it was safe to cross especially if livestock was been taken to market or packhorses were being used. As a result inns sprang up around such crossings and areas were often set aside to shelter livestock overnight or even longer. The villages prospered and there was even less need for the wilderness lands to be farmed. Similarly bad weather could regularly lead to the moors being impassable and if no other route could be found it was just a matter of sitting it out until the weather improved. Some diaries of the time reflect that between October and March it was not even worth trying to cross Big Moor. Some say it is still like that today! Improvements in trade lead to improved roads, bridges and Guide Stoops to aid the traveller. New roads were built funded by tolls during the nineteenth century and these formed the framework of our current network.